1.- When we want to represent a subtle paint chip, caused by the vibration of the vehicle or a small scrape, then we can appeal to these primer chipped paint effects. The paint is lost at its last and newest layer but there is no exposing of bare metal. Then the previous layers of paint reaches the surface that, in many cases, can be a primer which is red, gray, etc, but almost always the vehicle tends to have been repainted with the same colour and the paint chip can be done with a lighter shade of the base colour. This is a very easy to reproduce paint effect and we do not take too much risk on our model as it is easily corrected if we were wrong. We must give all of our care to where to paint them and which shape it will present. We must avoid regular, rounded, homogeneous or repetitious shapes. It is better to make some small paint chips beside a larger one and we have to make them in a way that always they are coherent to some structure of the vehicle, an edge, a volume, an opening mechanism, etc. We should never paint them on hidden or protected areas away from the effect of hits or friction. 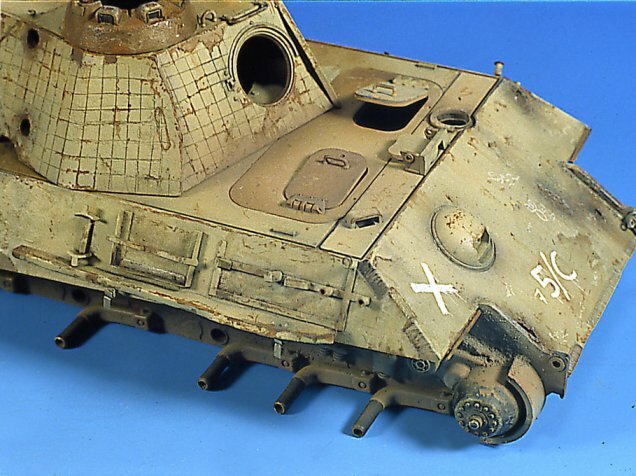 2.- The drained rust chipped paint effect is one of the most used whose results are always quite good. It give an aged character to the vehicles, as these types of paint chips are present after a long period. With orange enamel we will apply some paint chips, with diverse size, enrich them with some fine vertical lines in their lower part that we will stump later with the help of thinner and a clean paintbrush. Once dry, we will apply a centered dot of darker brown colour in the previous orange chipped paint. This example is very useful to make non working or abandoned vehicles. 3.- This is the typical deep chipped paint effect and it is same that can be seen both in the desert or in Russia. It is an older paint chip when compared with the ones above, so we can cover it with dust or a light layer of mud. It is accomplished inversely that the previous. First we apply the darker colour, and we enrich it with some small dots around it. After that, and always in the center, we apply the ligther orange colour, but without covering the darker base colour on the edges. In the desert Chevrolet truck different examples of this chipped paint type can be seen. 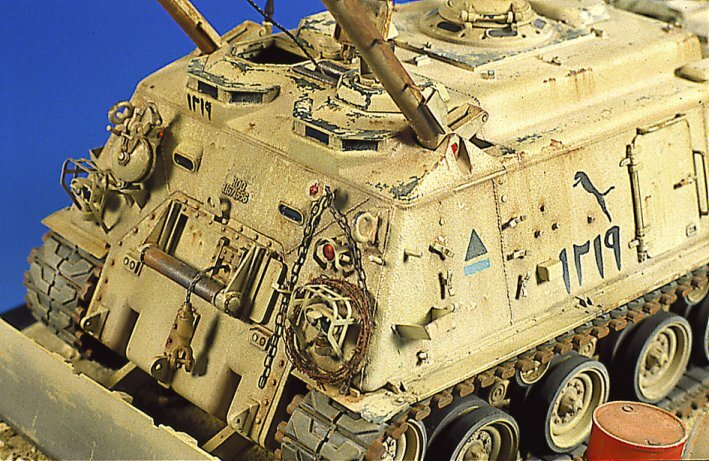 Also it could have been done only with darker colours as in the Pill-Box Panther, so we can achieve older and still wet rusty chipped paint. Keep in mind that a paint chip may present different colours if it is dried or still wet, newer or older. A new and dry paint chip will looks orange but an older and wet one will look red brown. 4.- This example it is not a real chipped paint effect as it is produced by the rubbing of objects on a dusty surface. We can imagine a small vehicle, a Panzer Grey Horch, in example, in the warm russian summer. The vehicle is taking more and more dust but it is forced to be hidden in a small forest. The undergrowth rubs on its dusted surface and this ends chipping off the adhered dust. Also its own crew will cause those frictions and superficial wearing. Now we repeat the action. Another dusty road day and again the friction. The different layers are one over the others creating a kind of transparencies. We can simulate this gray base colour effect, applied with a paintbrush over the dust. 5.- Chipped camo schemes. Many camouflages were applied at the front. Sometimes with good quality paints or with any other one available. These improvised colours do not tend be as resistant as the factory applied colours, so they were easily chipped. 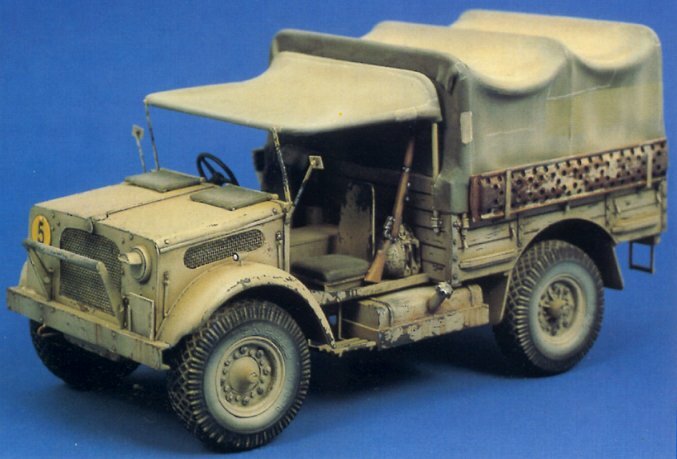 This was very common in late war vehicles, or in both desert or winter camo schemes. We can reproduce them as in step #1 now using the base colour over the camo one. In this example, the base color is sand while the camo is green. When the green paint is chipped off, the previous sand colour reaches the surface. Take care. these effects should be done in the very early stages of our painting works, even before the apliying of filters and washes. 6.- And, finnaly, the usual paint chip that has been well spread by Uncle Verlinden during his more creative period. The metallic paint chip. Perhaps this is the most difficult to reproduce, as a wrong application or chioce of the colour can make our model looks like sci-fi 23rd century Warhammer armour. We can think again of a M113 in Vietnam. In the jungle the hull was heavily clawed by the dense undergrowth. The crew was always riding atop their vehicles to avoid mines and they were contributing to these polished surfaces. We can try to use a little amount of Humbrol Silver enamel and to mix it with a little of Olive Drab, and then to directly draw the paint chips. The result can be outstanding when controlled, but it's best to be careful than than try for too much. We must to try to perfectly outline the cutting edges. These zones present very fine and polished chipped paint effects. And remember that there is a very easy way to reproduce them. with a pencil ! !